Well the big contest starts tomorrow, the white primer has been applied and the airbrush is going to get cleaned today; 1700 points will be near on impossible for me to achieve, but I will give it a go. Unfortunately timing is everything and I have been off for the last week and go back to work tomorrow, not the best of planning. Anyway, I thought I would post my last completed unit before the contest starts in order to not confuse things. So here we have the Brunswick Lieb (Guard) battalion. They fielded 691 men at Waterloo under Major von Pöstler. 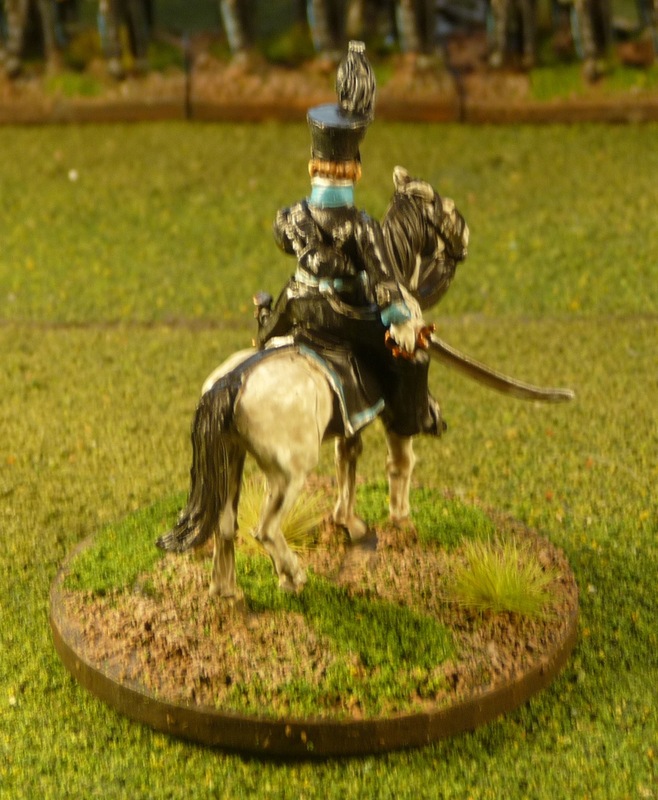 This was one of the few veteran Brunswick units at Waterloo and Quatre Bras, having seen action with the British in Spain. Very nice colour combination of sky blue and black, I enjoyed painting them. The Guard battalion was part of the light brigade and here we have Lt Colonel von Butlar, officer commanding the first brigade of the Brunswick Corps in the Allied Reserve under Picton. 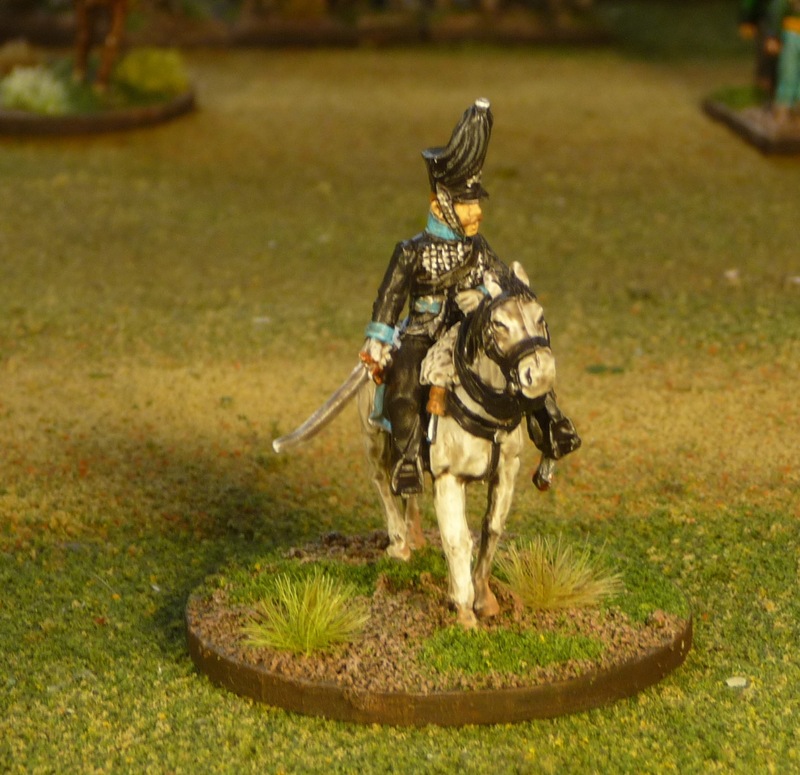 A little out of focus, uniform details from the Cent Jours site. I used a completely different technique to paint this battalion. 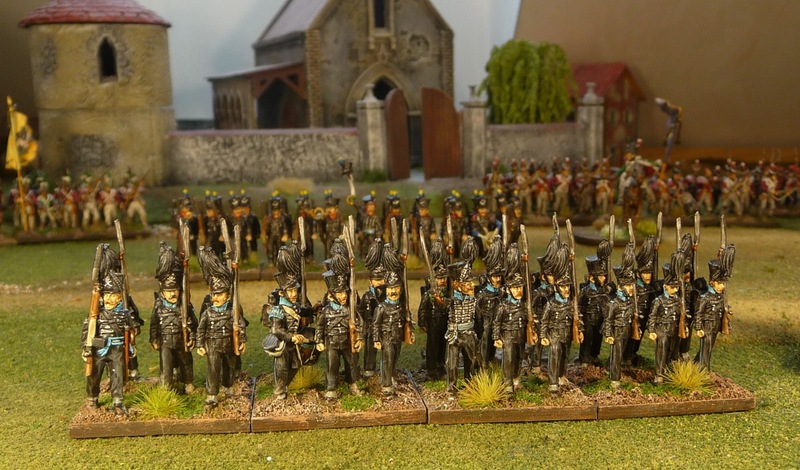 Here we have them next to the 3rd light battalion. Both primed white, but the 3rd were painted with a diluted wash of black ink, while the Lieb were airbrushed with Vallejo Black ink, and then drybrushed with 2 progressively lighter grays. There is a difference, I like the airbrush method better. 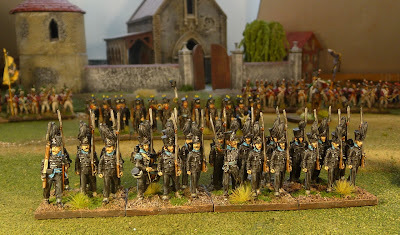 For my next unit I will airbrush them again but try a Vallejo Dark Prussian Blue as the first highlight at the suggestion of Burkhard. Anyway on to the contest I suppose. I like them both, John, but can't honestly say that I see much difference in the end results with the differing techniques. 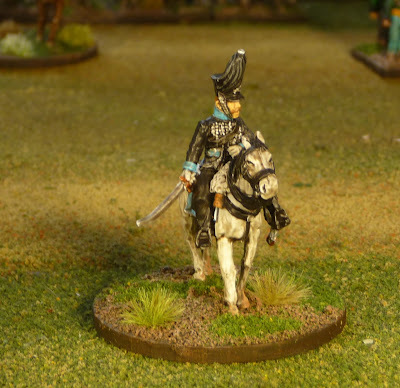 I quite like the dappling on the officer's horse, nice work! They look fantastic John. I've never used an airbrush for figures before and after seeing your results I'll have to give it a try sometime. 1,700 points! Yeh-Gads have you invented some kind of painting machine? great work, I to have used an airbrush for the base layers, but I got a bit lazy about cleaning it and tend to buy spray now. Looking forward to seeing your work as the comp continues. 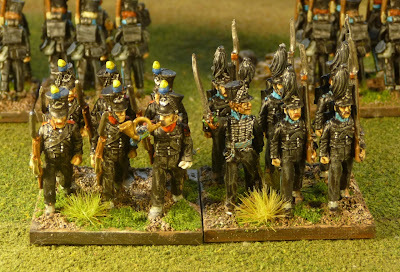 Nice work John, never heard of using dark blue to hight-light the black, I'll look forward to seeing them. Good luck in the challenge! Fantastic looking regiment, wonderful work...and good luck! Excellent unit. The Brunswickers add some "color" to the usual British red! Lovely unit. Looking forward to more. For sure they look truly greta John. Although I think it's hard to point the difference between your two technics, but I suspect you really save time with the airbrush. Also, did you ever try the hairbrush to paint the back of the heads? The Contest and the Prediction! Moria Goblins and they have a Cave Troll! !